This morning in an effort to encourage, my friend reached across the state line via text messaging and shared with me her daily devotional. I had gone to bed the night before feeling restless and sad. No one else knew how I was feeling, but the emotions had translated into a lot of tossing and turning in the night. Waking to her encouragement was timely, and I pondered on the passage she had shared. As I sat with the verses, I could hear God calling me towards humility. I hadn’t thought of myself as being prideful, but suddenly, I could see my need to be humble before God. Alone at my kitchen table, I ate my breakfast and I communicated with God. I prayed out loud and admitted the areas of pride to which I have been selfishly clinging. I asked His forgiveness and sought His help to relinquish my self-imposed expertise on any matter involving my heart. My heart is an untrustworthy vessel, and it will only be through the transformation of the Holy Spirit that I will ever again trust its workings. In this breakfast rendezvous with God, I remembered that His love is still greater than our failings. God’s mighty hand rules over us in pure gentleness. Like warm syrup falling across a waffle, his love embeds itself into us and into the crevasses we make available to him. The places we allow Him access to will be transformed by His love. The places we hold onto–will not change. We are incapable of change. He does the transforming–not us. After finishing my breakfast, I looked at my list of things I needed for the day’s task. My task for today was to begin the backyard remodel in our new home. 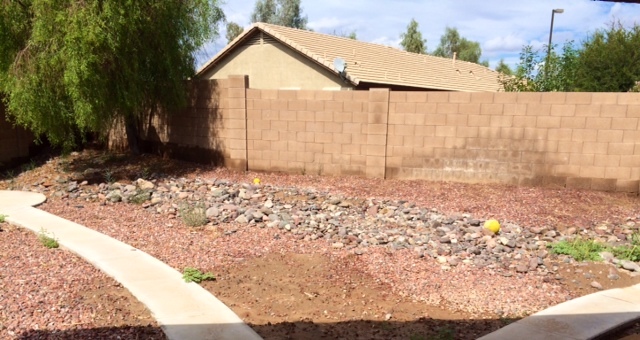 The first step in our remodel is to move several hundred river rocks from the center of the backyard to the side yard. I was going to need some sturdy work gloves and a wheelbarrow. As I drove to the hardware store to purchase the wheelbarrow, something caught my eye. The streets had a different look about them. 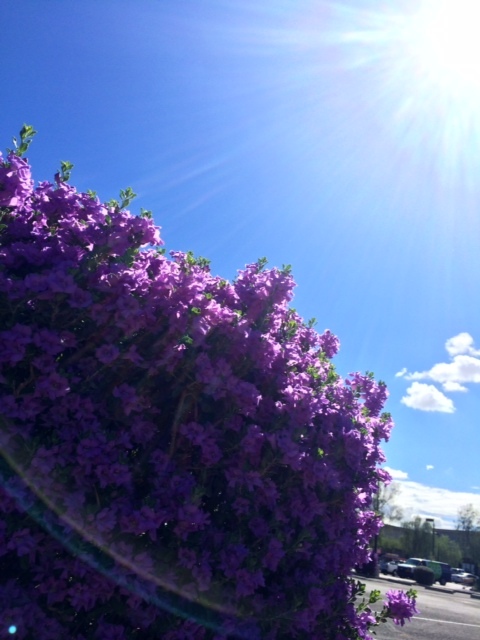 The rain had come to town for the last couple days, and now that it was gone–the flowers were in full bloom. When you live in the desert, you don’t miss a new blossom. I smiled at the thought of what the next year will be like–experiencing a new landscape with each new season. Returning home I went right to work moving the rocks. It was a cooler day–92 degrees at 11:19 AM–so it seemed like as good of a time as any to jump in and make some progress. As I began to move the rocks, I was full of energy. 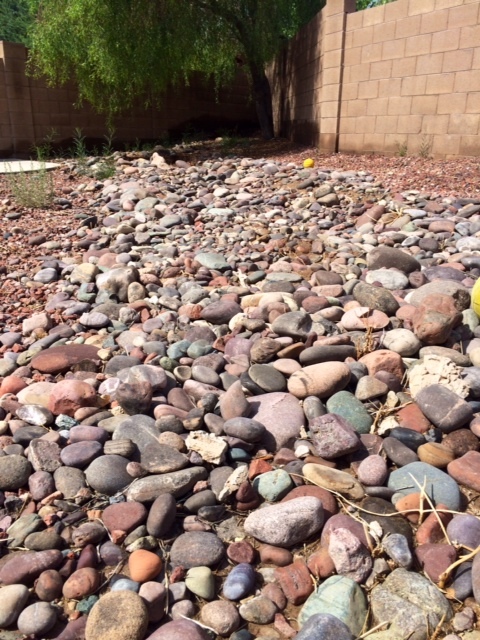 I used each rock as a tool in my current challenge to memorize the book of James. With each stone I would say a word as I tossed it into the brand new wheelbarrow. I was certain that with each stone I moved, I was making a difference in the terrain of our yard. My husband would return home pleased with my progress, and he would be relieved that the heavy work was not all falling to him. That lasted for about three loads in the no-longer-new wheelbarrow. I had just finished quoting James 2:13, Mercy (clink) triumphs (clink) over (clink) judgement (clink), when I turned to judge my rock moving, terrain changing progress. I slowly slid to the ground and sat on the hot stones. I used the back of my gloved hand to wipe the sweat off my forehead, and tried not to cry. THIS IS TOO MUCH. THIS IS TOO HARD. I could feel the heartache from the night before climbing back up in my chest. It was a determined climb–more determined than it had been in the morning. It was steadfast and mean, and it didn’t need help from a wheelbarrow to make the journey from my heart to my mind and then from my mind to my heart. The passageway was clear for travel. I began to survey the task I was attempting and compare it to what other people were probably doing. Other women, women of value, are dressed fashionably today–I am in a tattered, sweaty t-shirt. Other women, women I admire, are spending their day accomplishing great deeds in the Kingdom of the Lord–I am moving rocks. Other women, every other woman in the world, had the foresight to protect her household, to honor her husband, and to treat the people who trusted her with respect–I am a failure. I sat on the hot river rocks and began to cry. 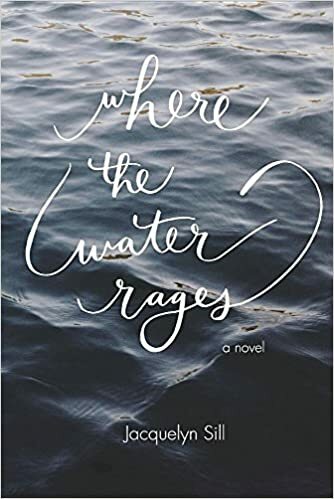 The tears were unpleasant, and because my hand was gloved, I couldn’t even wipe them away. The moment could have been lovely. In a field with flowers and shade trees–God could come and surround me and give me His comfort. But, not in this desert. There is no comfort among rocks. 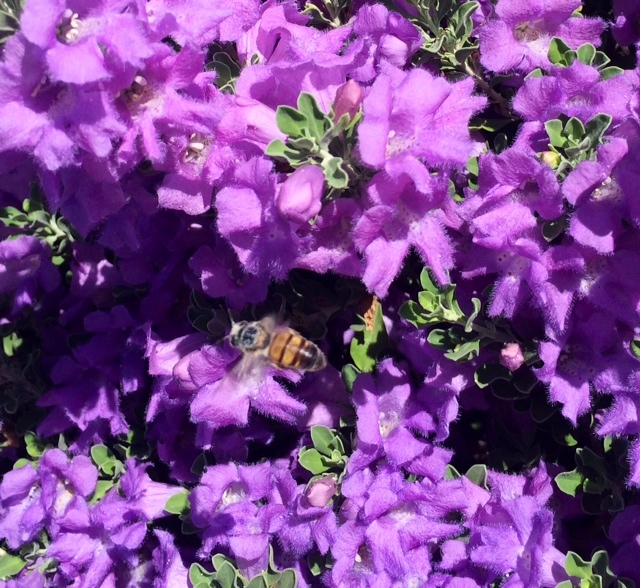 And with the scripture came an image of the color purple. My mind reeled back to the drive I had made earlier in the day. 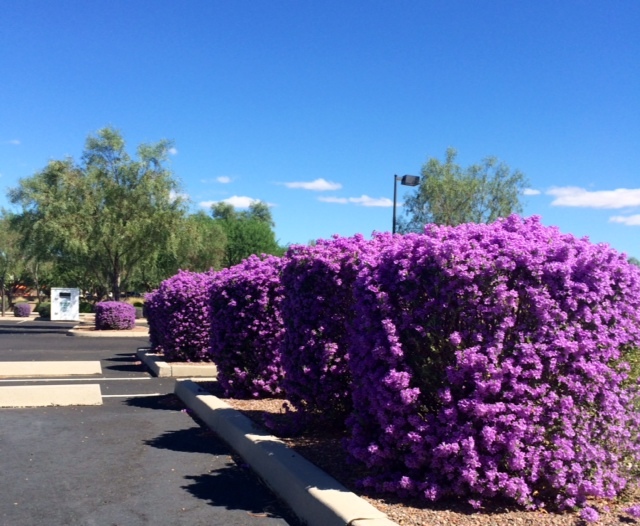 When I had pulled into the parking lot at Home Depot, the shrubs that I had seen several times since moving two weeks ago were blooming with brilliance. It was stunning and I was so moved by the plants, I pulled over to take pictures. What moved me was that in God’s timing–He had changed the plants. They seemed to have erupted overnight. I had driven through the parking lot two days prior and didn’t see one flower, but in God’s due time, He had created something beautiful. So lovely that I couldn’t help but stop in the middle of the hardware parking lot, among the contractors in their trucks, and snap pictures of the lovely shrubs. Like parking lot attendants promoted to Royalty, they stood proudly, displaying their new attire for the season. After a time of rain, the King had clothed them in splendor. He didn’t require anything from plants for the beauty in which He had so lavishly splayed on them, but they couldn’t help but lift their delicate branches upward–reaching to Him and giving Him the glory and honor that was due. It amazes me how feeble our hearts can be. If we put our trust in the emotions that we feel throughout the day–we can find ourselves in a hot whirlwind of confusion. Lost in the desert, while holding a map and compass. Everything that this world offers proves to be untrustworthy. If we put our faith in the stories we conjure up in our imaginations, if we spend even one moment comparing our lives to the unrealistic life of someone else–we are doomed. God wants to be involved in every step of this lifelong journey, not so we won’t fail. God isn’t afraid of our failures. He expects them, allows for them, but never, never turns away. He is on His throne in the midst of all that seems insurmountable, and He is also in the dirt lifting us up during those same insurmountable trials. Through His methods He is transforming our lives from something hard and uninspired into something useful and lovely. 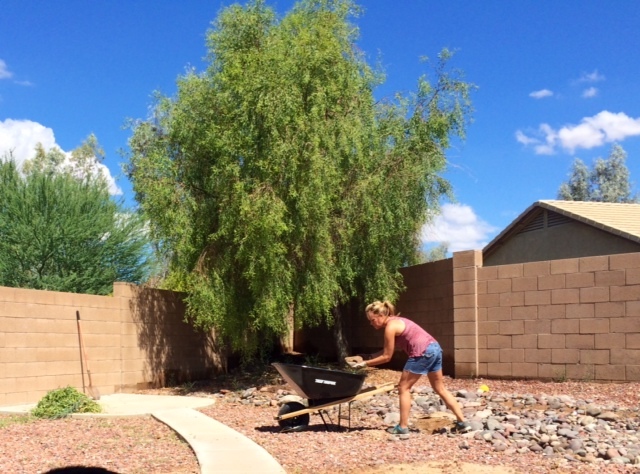 Moving rocks in the heat can feel torturous–but it is, yet, for a season. There is no reason to strive and worry. This is but a season, and each season has its own kind of beauty. I love you very much, Mr. Sill. Thank you for helping me become the woman God made me to be. Geeta, thank you for being such an awesome example in my life. His plans for you are firm and real. You write so beautifully, Jackie, of all that’s in your heart. You have a gift and are very talented. It’s good to see you using that gift – someone will always be inspired. Today, I was 🙂 I love you! Vina, you are such an inspiration to me. I want to learn to love people like you do. You are so free. It’s something that can’t be taught or caught–it’s who you are. I’ve always envied it–I pray God opens my heart to love like that!